Everybody knows My Sharona and some may even remember the thrill of hearing the libidinous lyrics of Good Girls Don’t on the radio as a kid and wondering whether the adults simply didn’t get it. (To be honest, I’m not sure I had a clear grasp as a 15 year old of what exactly it might mean to have a girl “sittin’ on your face” back then myself.) If one or both of those songs are the full depth of your knowledge of The Knack however, I’d argue you are depriving yourself of the experience of enjoying one of the best power pop albums in the history of rock music. 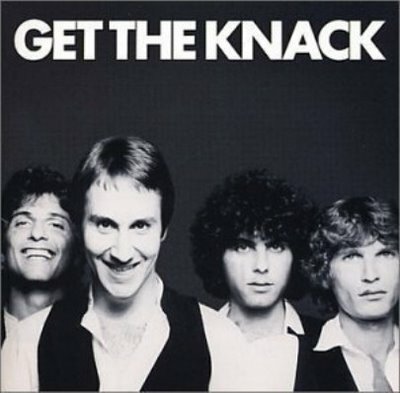 The Knack’s 1979 debut album “Get The Knack” was a massive success when it first hit stores, but the subsequent three decades seem to have condemned it to relative obscurity, save for the occasional appearance of My Sharona on a movie or TV show soundtrack. Even if you think My Sharona is as deep as you want to dig into Knackdom, I’d urge you to pull it out or load it up and give it a renewed listen with fresh ears. Initially you’ll sing along and smile but probably not think much more of the catchy riff and earwig chorus since you’ve heard it a million times, but I ask that you force yourself to really pay attention starting at the 2:45 mark when the extended guitar solo kicks in. I doubt many think of My Sharona as a guitar hero song but listening to it again now at my behest you’ll have to admit that the minute and a half long six-string workout is easily one of the most well-crafted and skillful monster rock solos ever slipped secretly into a giddy pop song. Awesome! But, don’t stop there. The whole album is filled with killer riffs, breathless drum runs, and pulse-altering bass lines, all tucked inside catchy-as-hell power pop tunes that get stuck in your head for hours if not days after just one spin. To my ears, there is a direct line from the feel-good rock & roll of Buddy Holly to these Knack songs, and not just because of the cover version of Heartbeat included on the LP. Oh Tara might rival Holly’s Maybe Baby as an anthem for all those teenage boys who have desperately but secretly loved some young beauty who never thought of them as anything more than a friend. The playing on Get The Knack is tight and groovy. Beyond impressive pop sensibility, the members of the band really know how to play their instruments and, more importantly, how to blend their individual sounds into a greater whole. After the first few listens, try isolating the individual two guitar, bass, and drums parts in each of the songs. Each band member is busy throughout. The faster tunes are filled with endless guitar fills, constantly-changing bass lines, and strident drum runs that all seem to be equally high in the mix but somehow never overpower each other or take away from the sing-song verses and choruses that carve deep sticky ruts in your brain. (She’s So) Selfish, Let Me Out, and Frustrated all chug along like yapping poodles on speed and yet, when they’re over, you’ll find yourself mentally swaying back and forth like a lighter-waving hippy in the midst of a 20-minute Free Bird at a Lynyrd Skynyrd concert. The Knack somehow manage to rock AND groove simultaneously. I admit I was one of the boneheads that killed The Knack. Like many (most), I bought the first album when it was new, spun it raw, and then never seemed to remember to try out any of the band’s subsequent output. I don’t know why. It may now be too late to, um, maybe pay a little attention as a way to repay The Knack for the 30-plus years of joy their first offering has given me, but I can at least keep waving the flag in support of that one glorious effort. So, go get Get The Knack. There’s nothing guilty about this pleasure. I discovered “Get The Knack” last year and was blown away, especially by the killer guitar solos. There’s some wonderful live Knack stuff on YouTube. Great post! Unfortunately, they will forever always be known just for My Sharona but you’re right, this album is brilliant. I visit as well. Berton Averre’s guitar solo on the song is truly underrated. Lovely piece on a real power pop gem. Nothing to add to your excellent summary.